An outline planning application has been filed by Rand Brothers, to create access onto the site known as BK3, with the potential to create up to 140 new properties . This would swell the village by 60% in 2-3 years. We, the Parish Council, accept the need to develop new properties in a proportionate manner, and with regard to the character of the village. However we strongly object to the over development of site BK3, an plot of 7.76 hectares with no prior improvement to the infrastructure. We believe the application will create an unsustainable development, that will not be supported by the creation of any employment, and that it will cause increased use of private vehicles as new residents will commmute to work or to the train station. The Parish Council has learned that the current Rand's Outline Planning Application on the land between Royston Road and Cambridge Road has been placed on hold until at least the end of the December in anticipation of the Planning Inspector's Modifications Report on the emerging Local Plan. The Modification report is due sometime soon, it will make any recommendations to change the emerging Local Plan to make it "sound" - the contents of the report will very much decide the fate of BK3 and the future of the village. It will go out to public consultation and we will respond accordingly to any "decision" which has potential negative impact on our community. The PC has received many requests as to why we have not engaged a barrister to fight the Rand's application, which we feel deserves explanation. Quite simply, until a decision is made on the Outline Application or the Local plan, there is NO legal recourse for objecting to an application, and nor is there any legal recourse for appealing against a decision to grant planning application, if that were to happen. The Local Plan however is a different case and we are keeping our options open depending on the Modifications Report. The PC has however engaged a Planning Consultant who is providing sound advice on the Local Plan, the Outline Planning application and we have taken the decision to apply for a grant to press ahead with producing a Neighbourhood Plan in conjunction with Nuthampstead. The public have up until 26 July to voice their option to NHDC Planning dept on this development and we urge you to do so. The full application and related documents may be viewed on the NHDC planning portal, but we must point out this is an outline planning application, the aim purely being to get the access permission onto the site from Royston and Cambridge Road. All other details of the application are speculative. If outline permission is granted, the land will most likely be sold to the highest bidder, who then would submit a detailed planning application. We suggest registering your objections using at least 2 of these methods above. In particular, the NHDC Planning Portal is limited to a maximum of 3000 words, so this won’t work for lengthy objections. It’s important that objection letters represent your individual perspectives so we haven’t provided one standard letter for you to use, however you can find below a list of key objections you may want to consider using, and an outline letter, and a short guide on how to use the NHDC Planning Portal. Every adult in your house is entitled to send their own objection, even if living at the same address, please consider doing this as one factor that the council will consider is the overall number of objections. Should you require any assistance, please do not hesitate to contact a Parish Councillor. To assist you you make click on the links below to obtain examples of letters of objection. Anyone may object and we encourage you to make individual objections. Anyone may submit as many letters objecting as they wish as long as each letter contains unique objections. Any letters coming from the same address should not be identical or they will only count as one objection. Joint letters will only count as one objection. Objection Letters must not contain personal comments - we draw your attention to the main Planning page here which advises what are, and what are not acceptable objections. You may also wish to consider to use some of the phrases on this page to strengthen your objection. A development should have sustainable transport plans which include measures to reduce the use of private cars by replacing them with public transport or low carbon alternatives. There are no plans to improve local public transport links, this will increase the use of private cars to access local amenities in Barley, Buntingford and Royston. It will not discourage use of private transport to access schools and will affect public bridal ways and footpaths, and does not recognise the needs for access to existing amenities by those of impaired movement. As no jobs are being created, persons will be required to rely on private transport to commute to work outside the village. The massive developments in Buntingford have not resulted in improved bus services, to the contrary, the bus services in Barkway were changed recently with the 331 service from Hertford, now terminating at Buntingford, and the new number 18 service from Buntingford offers a reduced service that does not enable train commuters to connect early enough to the station in the morning, then only offers 1 evening return bus at 17.09. Barkway has limited amenities, a pub, a school, petrol station and car service stations. The current local school is able to accommodate 50, 5 to 9 year olds but is in a federation partnership with Barley, so only years 1 & 2 are taught at Barkway, years 3 & 4 are taken by school minibus to Barley. There are no sixth form colleges in Royston, sixth formers must now travel to Baldock some 13.6 miles away for which there is no bus service, or alternative public transport route from the village.. . Under NPPF policies Local plans should take into account local Amenities and access to them. The proposal does not promote sustainable communities that enhance or maintain our rural community, and does not ensure a sufficient choice of school places above primary level. Contravenes NPPF 38, 55 and 72. The development proposal would fail to positively enhance the wider landscape setting of the village, nor would it improve the character and quality of the Rural Area and, as such, would afford significant and demonstrable harm to the intrinsic beauty of the countryside. This harm is considered to clearly outweigh the benefits of providing new dwellings on the site. The proposal is therefore contrary to the provisions of saved Policies 6 of the North Hertfordshire District Local Plan No. 2 with alterations and, Paragraph 17, 109, 116, 156 of the National Planning Policy Framework. Outside the permitted development boundary. Whilst the Local plan proposes the site, known as BK3 be included and the development boundary then changed to include the site, the Local Plan has not yet been approved by the Planning Inspectorate. NHDC will normally permit development proposals if: The site lies within the main area of the village; and the proposal would maintain or enhance the character or visual quality of the village. 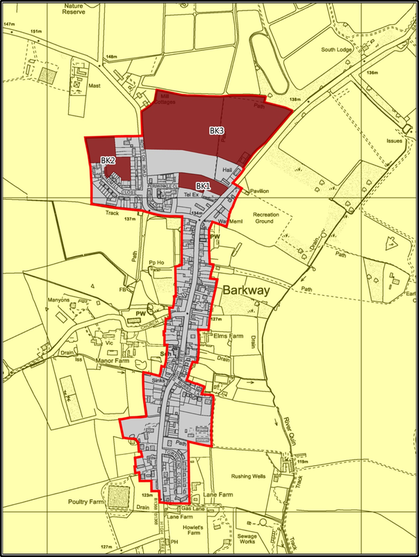 NHDC are seeking to move the permitted development boundary of the village to include BK3 without prior consultation with the surrounding area.